Traditional Sunday lunch at the Saracen’s Head with all the trimmings? Oh yes! Living in the UK you get quite accustomed to the Sunday roasts – a typical British dish you must try when visiting from abroad. 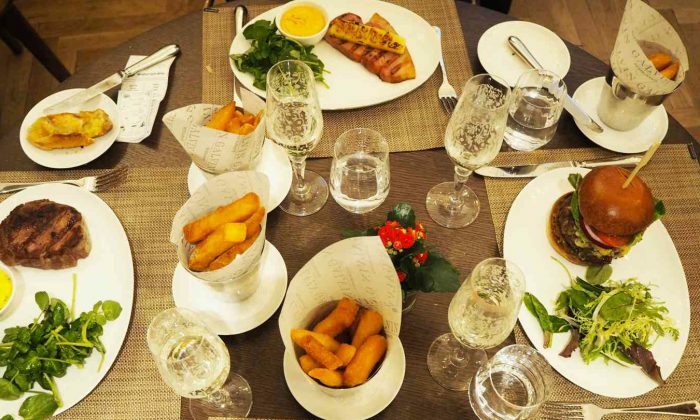 Aside from our love of brunches in London, we do love a good Sunday lunch! 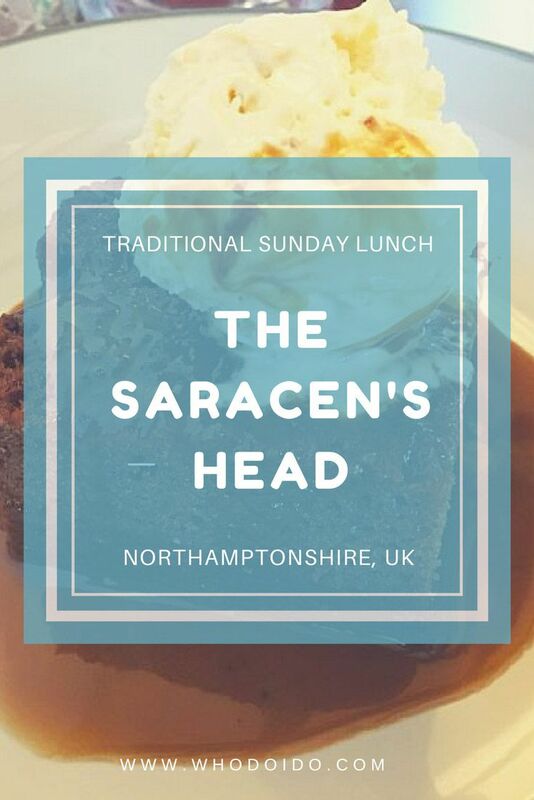 One of our favourites spots to enjoy a traditional Sunday lunch is at The Saracen’s Head, located in the small village of Little Brington in Northamptonshire. 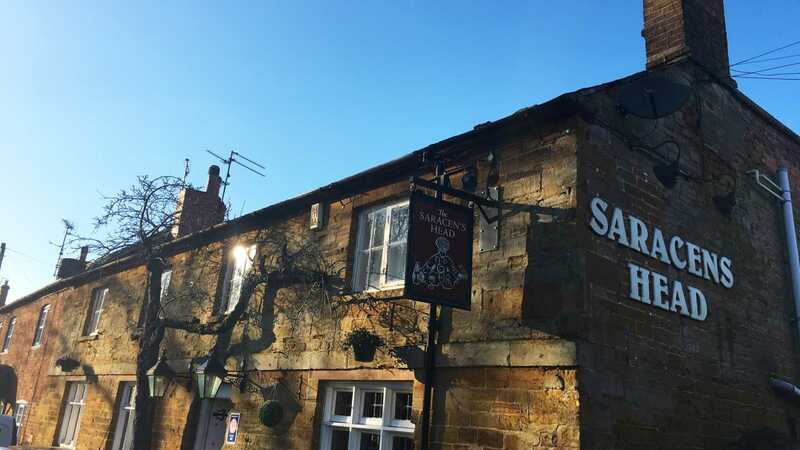 The Saracen’s Head is a cosy and charming pub, built from 17th century stone and lies close to Althorp House – a stunning stately house with acres of beautiful countryside and the ancestral home of Princess Diana. 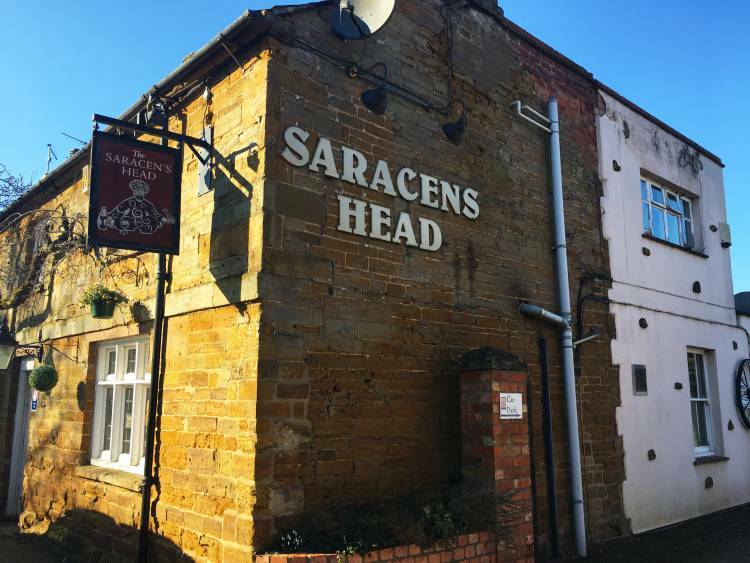 As you step inside The Saracen’s Head, you are welcomed by the friendly staff behind the bar pulling pints of ale and lagers for the locals. With the traditional wooden beams across the ceiling and the dark wood interior in the bar to the tables and chairs, it definitely gives a warm and relaxing atmosphere. I love the fact that they’ve included beer barrels to perch and rest your drinks on whilst watching the TV. 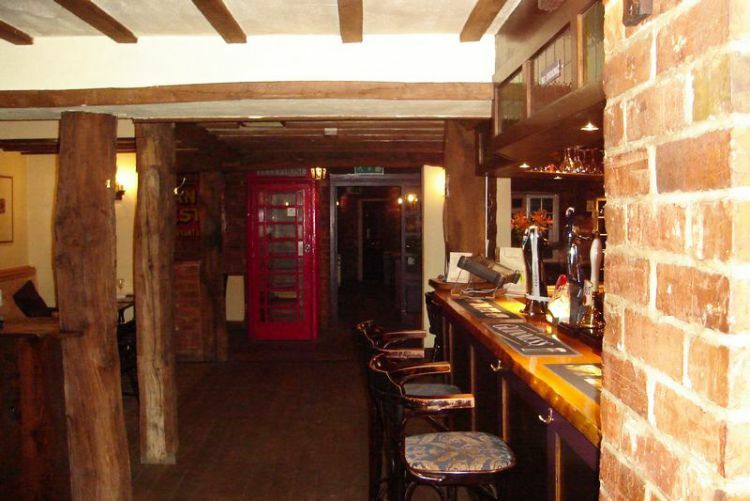 Tucked away in the corner of the room, there’s even a traditional red telephone box which still works! We ordered our drinks, placed them on our tab and were led through to our table in the dining area behind the bar. There are a couple of tables by the bar area and two separate dining area for diners who have made a reservation. 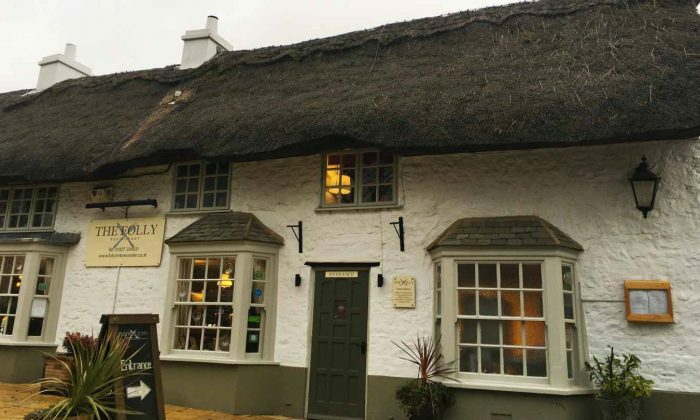 This pub does get fairly busy especially on a Sunday and is a firm favourite with the locals, therefore we highly recommend booking a table in advance. 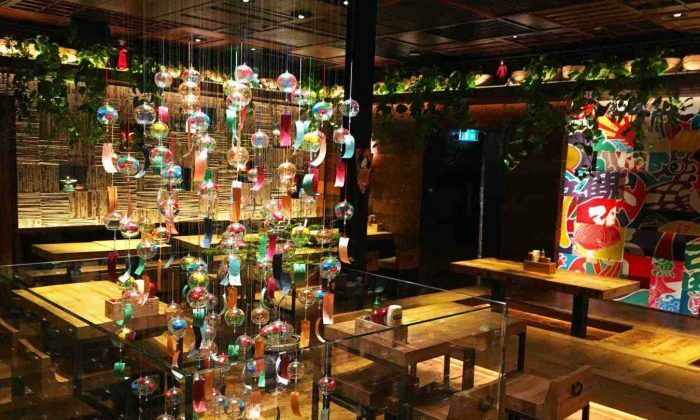 With our drinks in hand, we browsed the menu deciding whether to go for two or three courses. Decisions decisions! We finally chose two courses and if we had room after the main course, then order a dessert. There was a great selection of dishes to choose from, making if difficult for us to choose. For the starters, Ian opted for the Gambas! Succulent king prawns in chorizo and garlic with a tomato and chilli ragu. Ian offered me a king prawn to taste and oh my, it was packed full of flavour with a kick of chilli at the end of the mouthful. The sweet vine tomatoes with the slight saltiness from the chorizo complemented the dish. 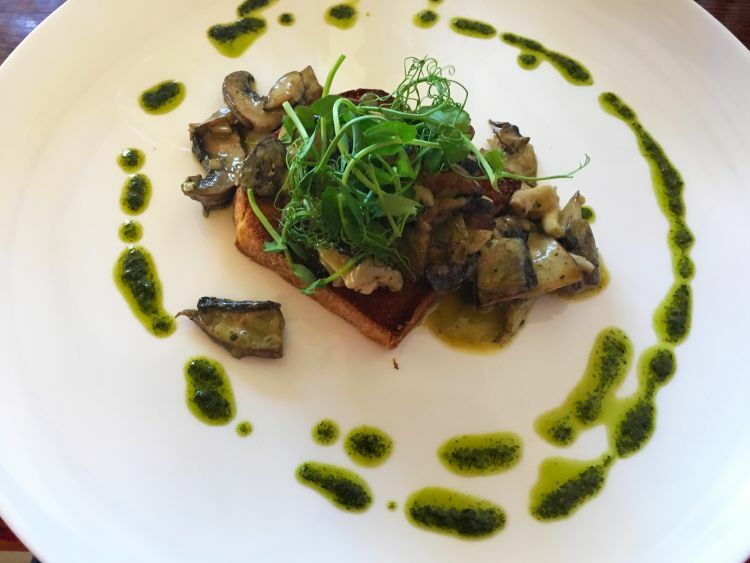 I chose a simple dish of creamy wild mushrooms placed on a toasted brioche, drizzled with rosemary oil. You could taste the hint of garlic which the mushrooms were tossed with and the rosemary oil had a very subtle flavour. I used the brioche to mop up all the creamy sauce. Mmmmm I could have eaten another serving! Feeling content with our starters, we eagerly waited for the main courses to arrive. Both of us chose the same main …. 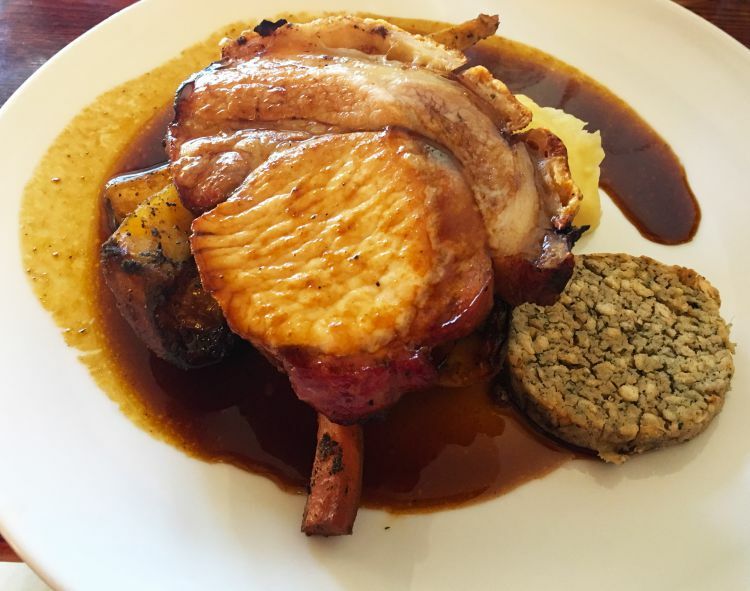 roast pork with sage and onion stuffing, parsnip, carrot and roast potatoes. Having had beef the previous night, we thought the pork would be a change and fancied a bit of crackling on the side! 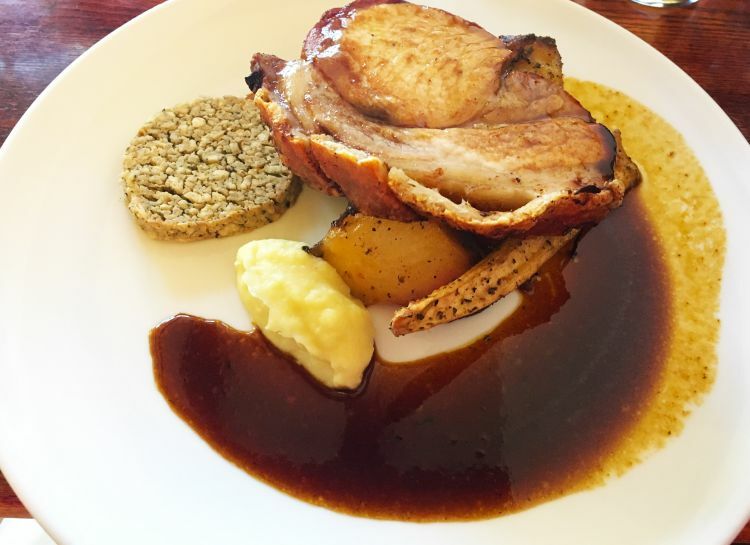 The portions were very generous indeed – the pork was cut thick served with a small portion of stuffing and a rich gravy – you can always ask for more gravy if required. 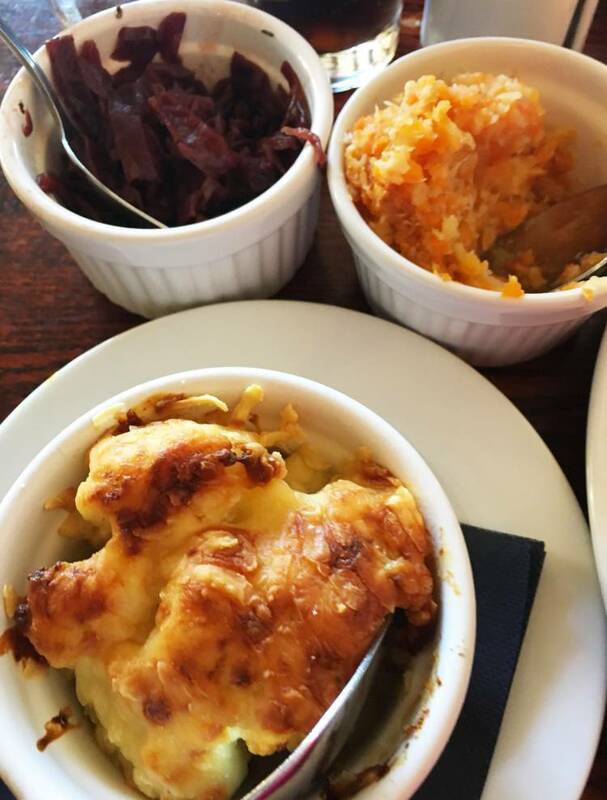 A variety of sides accompanied the meal; spiced red cabbage, mashed carrots and swede and cauliflower cheese (our favourite!). Unfortunately we did find the stuffing a bit dry and the outside part of the pork was a little dry too. However, the centre of the meat was juicy and moist. I took my time munching through the crackling, not letting Ian have my piece. Ha ha! 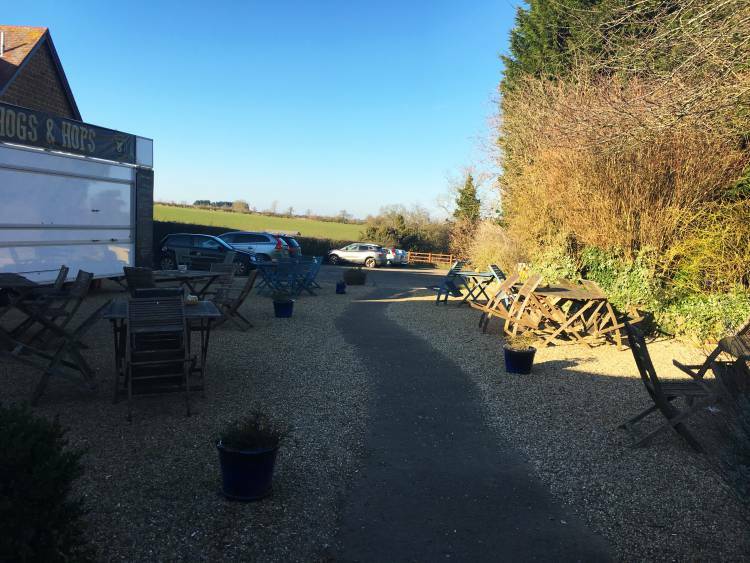 We noticed that the next table was eyeing up our roast pork and ended up ordering that too! 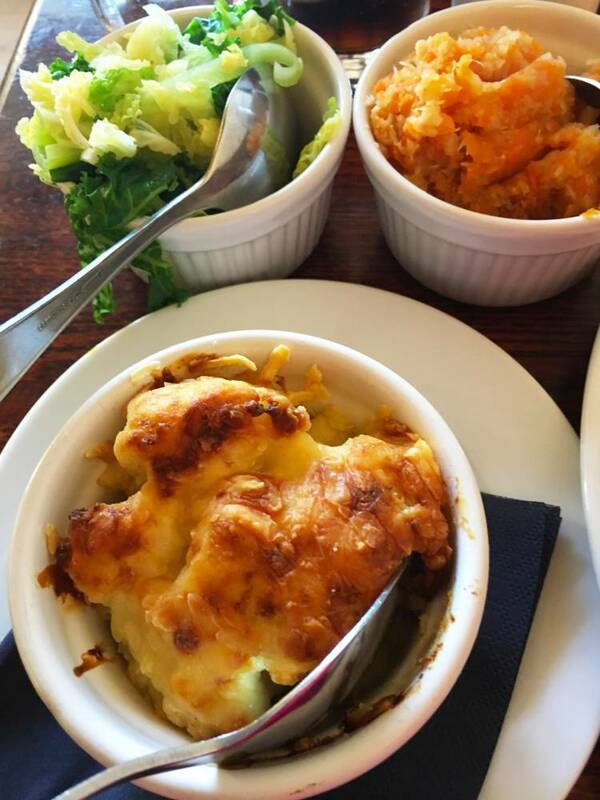 All the ingredients are locally sourced for the homemade dishes. For the roast rib-eye of beef, a huge portion of Yorkshire pudding was served. 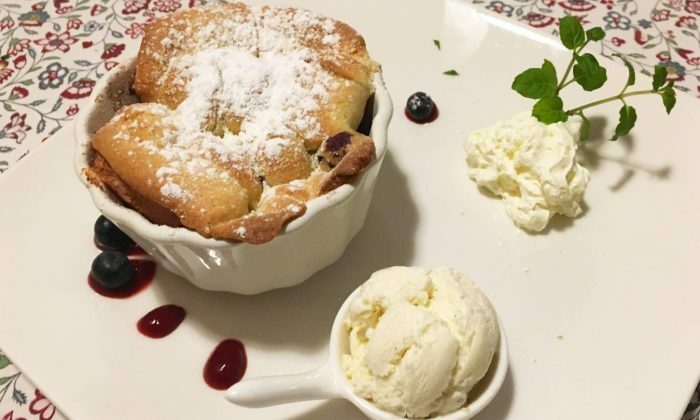 Did we have room for dessert? Yes we did! What caught our eye were the crème brûlée and the sticky toffee pudding. 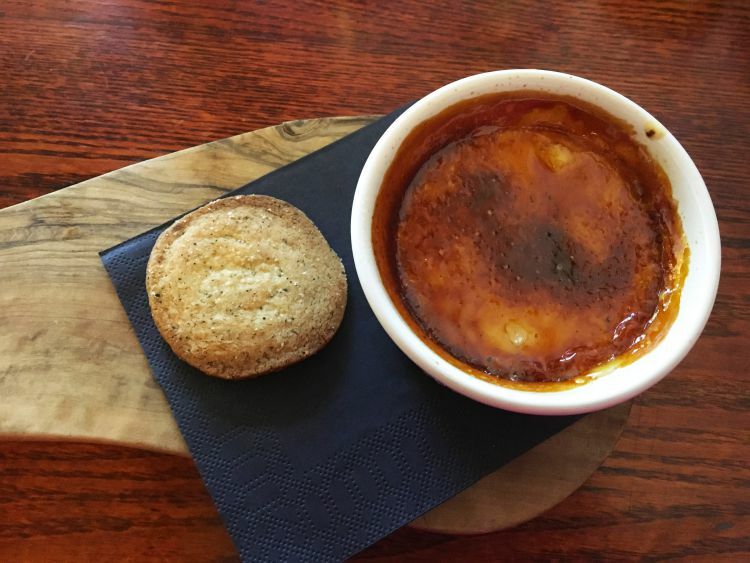 I chose the the morello cherry crème brûlée served with a piece of shortbread. The caramel had the perfect sound when I cracked it to break through for the custard underneath. The lovely sweet morello cherry was rippled inside which wasn’t overly sweet, and was very smooth and creamy. The shortbread had a slight hint of Early Grey which was perfect with the crème brûlée. Ian’s date sticky toffee pudding with white chocolate ice cream was decadent. 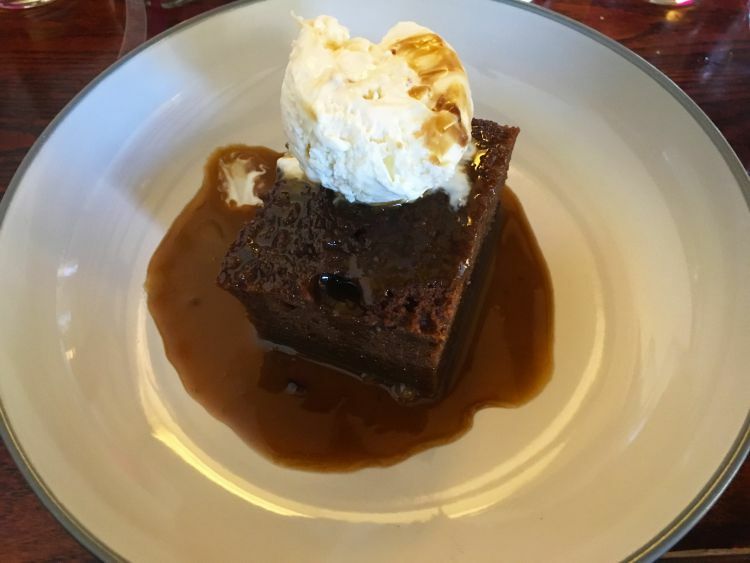 The pudding was lovely and moist with rich salted caramel and black treacle sauce poured over it. The white chocolate ice cream went wonderfully with the sweet sticky pudding. 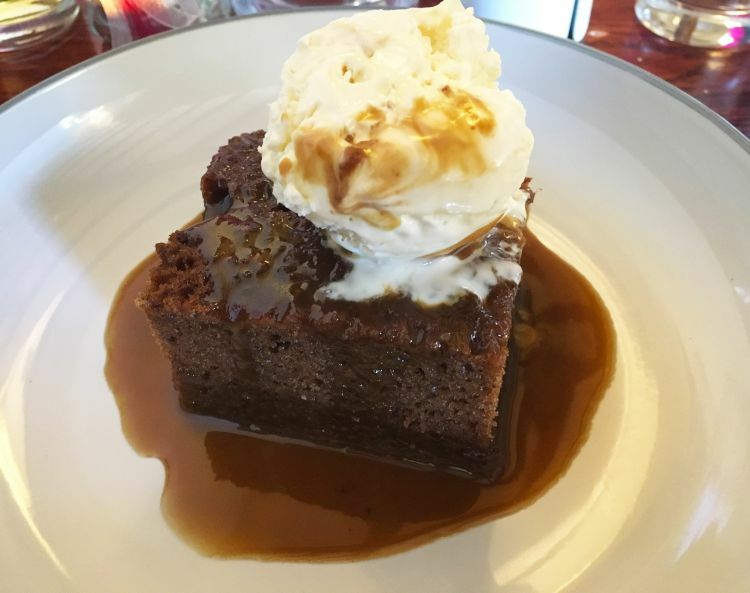 Ice cream with sticky toffee pudding is a marriage made in heaven. Very calorific, but who cares! 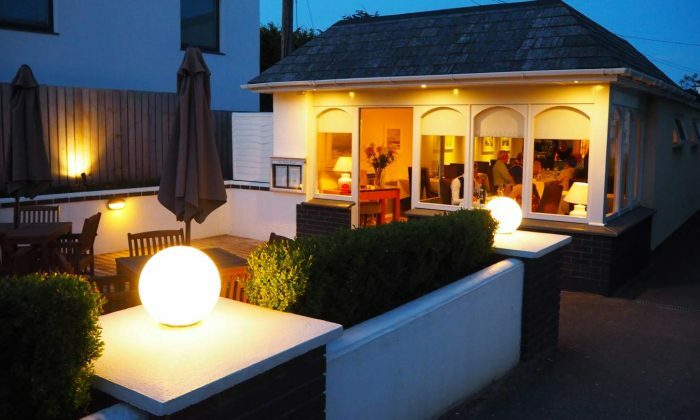 During the Summer months, enjoy your meal or even a drink in the outside seating area. 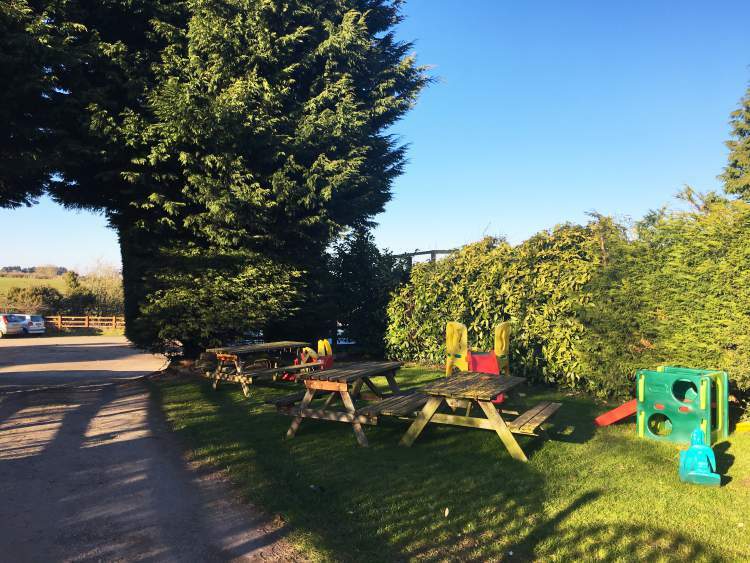 Watch the sun go down with a pint of cider in hand … perfect! Also an ideal place to catch up with some friends. Overall, the food was delicious, very generous portions and a good price too. 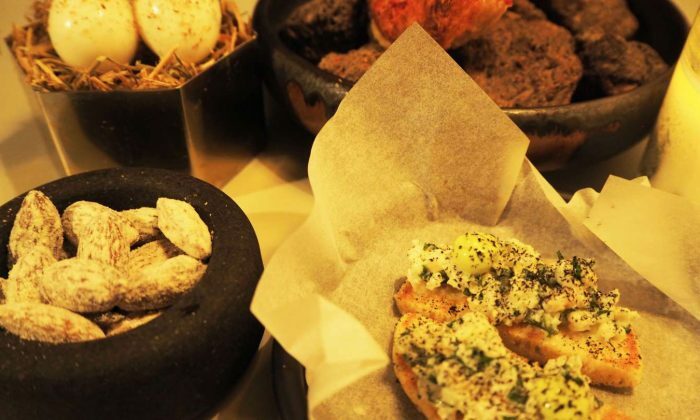 Each plate of food served, was well presented and you could taste that the freshest ingredients were used. 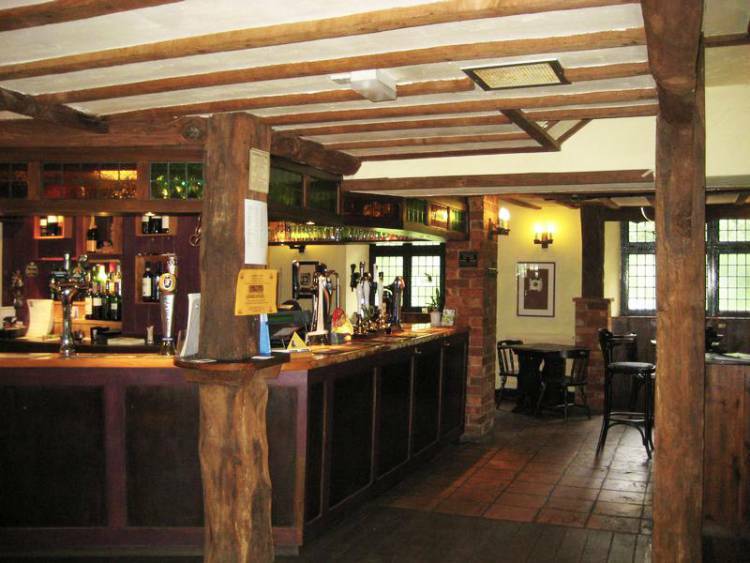 We loved the cosy ambiance of this lovely quaint pub and the staff were very friendly and welcoming. 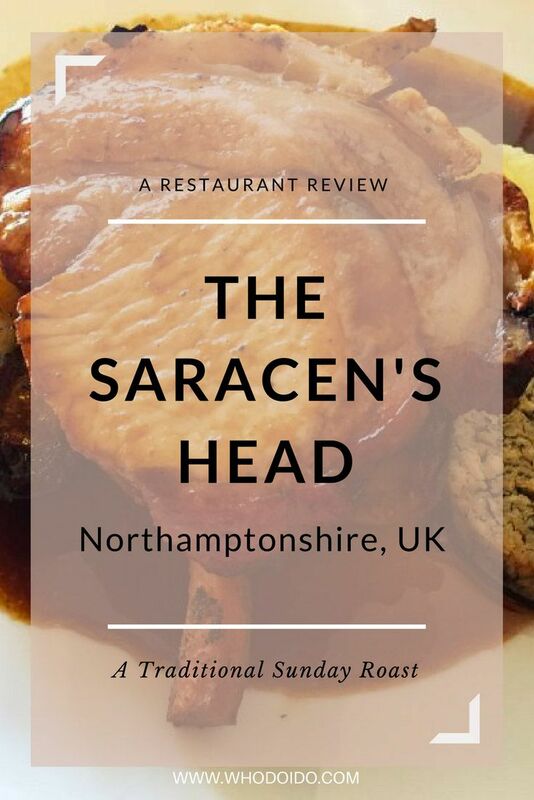 The pub is close to Althorp House, which makes Sunday lunch at The Saracen’s Head a great stop after a countryside walk. Do you love a Sunday roast? 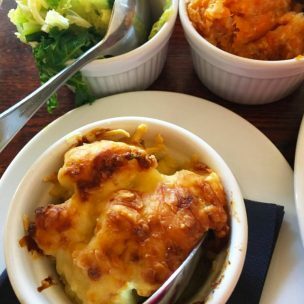 Where’s your favourite spot for Sunday lunch? 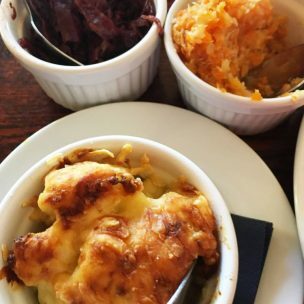 I love good pub food and a good Sunday Roast Dinner so your photos has got me drooling..all the dishes look so good and the price of £40 for a 3 course meal is so worth it! 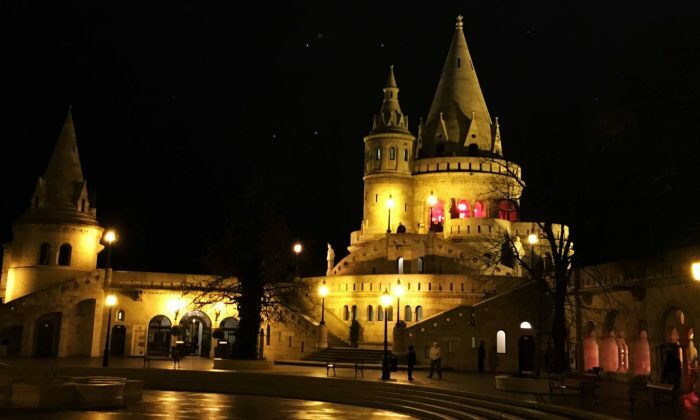 Oh wow, the pictures in this blog are amazing! My mouth was watering and my stomach was grumbling by the end. Love reading about these local finds. Now I just need to get myself out there! What a great blog post that has now made me hungry, LOL!! Those photos made me feel like I was right there with you enjoying everything. And what a charming little spot, inside and out. 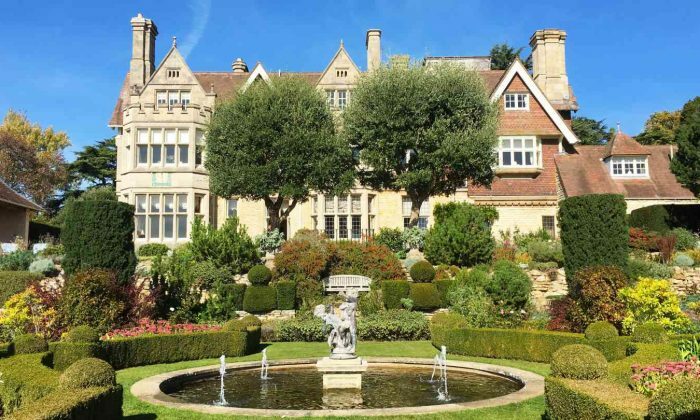 I sure hope that I can visit here if I am fortunate enough to visit the UK!! That building is beautiful! I love old buildings! Me too! Love these cosy pubs! 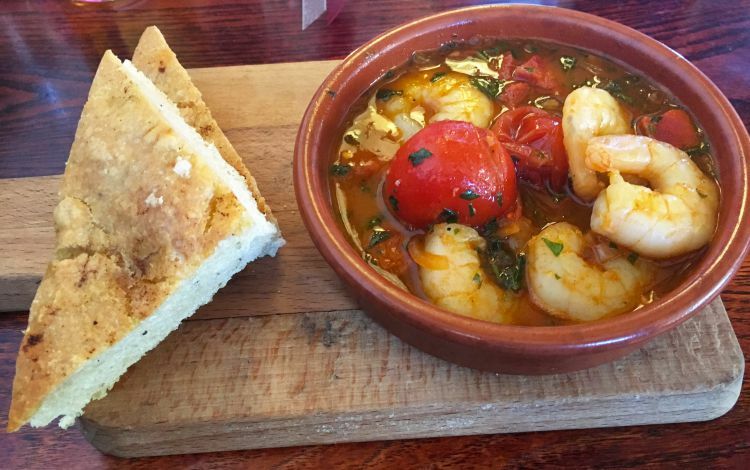 I love the sound of the King Prawns with Chorizo. I’m the only one in the family who likes prawns so I always have them when I’m out! 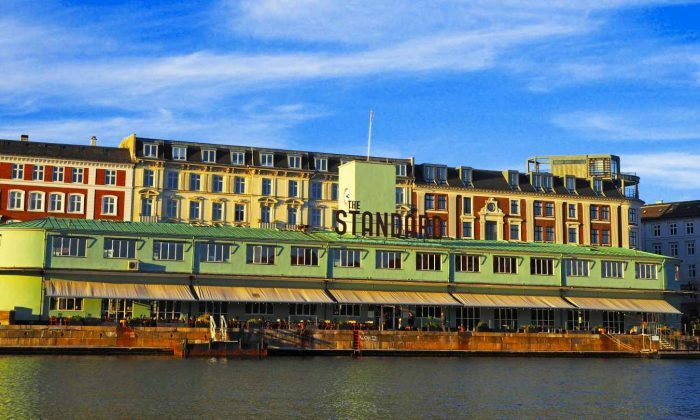 Lovely looking pub. I totally want that sticky toffee pudding NOW!! Like in my belly now! The roast pork looked delicious as well but how disappointing that outside of the pork and stuffing were dry. It’s okay though, just dump a little more gravy on top to moisten it right back up. 40 pounds is not bad at all for 3 courses and a drink, especially with such a large slice of pork!